Founded in 1956, Alfred Hitchcock’s Mystery Magazine is probably the longest-running mystery magazine on the newsstand today. If your dark writing has a mystery structure to it, this might be a good venue for you. 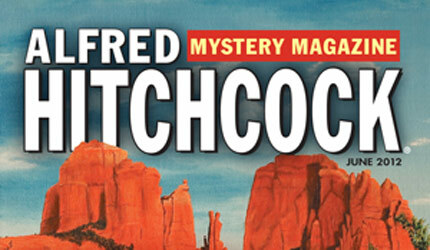 Initially, Alfred Hitchcock’s Mystery Magazine licensed the Alfred Hitchcock name. Hitchcock the man was not an editor of the publication, but his television show did adapt a number of stories from it for the small screen. Since the early 1980’s Alfred Hitchcock’s Mystery Magazine has had female editors, first Cathleen Jordan and now Linda Landrigan. Click here for a printable Adobe Acrobat version of these Writers’ Guidelines . Click here to subscribe AHMM today… . Style. We prefer that stories not be longer than 12,000 words; most of the stories in the magazine are considerably shorter than that.They should, of course, be well written. We are looking for stories that have not been previously published elsewhere, and among them for those that are fresh, well told, and absorbing. They should be entirely fiction: please do not send us stories based on actual crimes, for instance, or other real-life events. Please do not justify the right-hand margin. The number of lines per page should be uniform. Indicate line breaks with a single line and a centered pound sign (#). Every page of the story should be numbered, preferably in the upper right-hand corner. If you number the pages by hand, be sure before you start that no page has been omitted. Do not use the italic, large-size, or boldface characters some computers are capable of generating. Underline words to indicate italics. Indent for each paragraph. Do not leave 1-line spaces between paragraphs. Stories should be mailed to us flat, with the pages bound together by a paper clip only-not stapled or enclosed in a binder. A cover letter isn’t necessary. If you want the manuscript returned in the event we cannot use it, you must include a self-addressed stamped envelope; contributors outside the U.S.A. should send prepaid International Reply Coupons in lieu of stamps. If you have sent us a photocopy and do not want it back, please advise us of that and enclose a smaller SASE for our response. Please keep a copy of any material submitted, since we cannot be responsible for lost or misdelivered mail. If you would like acknowledgement of receipt of your story, include a self-addressed stamped postcard in your original mailing that will be returned to you when your submission is opened. We do not accept electronic submissions. Please do not send disks or e-mail attachments unless we specifically ask you to. Revisions. Revised versions of a story should be submitted only on our request, as a rule. At the very least, tell us in a cover letter that the story has been submitted before but has been revised, and explain how. NOTE: Stories submitted to AHMM are not also considered by or for Ellery Queen’s Mystery Magazine, though we share the same address. Submissions to EQMM must be made separately. Querying the status of your submission. We give each submission thorough consideration before responding. Our reply may take three to five months. When querying the status of your story, include your name, the title of the work, and the date you sent it in an e-mail to alfredhitchcockmm@dellmagazines.com. Manuscripts are filed by week of receipt, so the more precise your query, the faster we will be able to locate your story. Posted by Gothic.net on Saturday, May 5th, 2012. Filed under Headline, Professional. You can follow any responses to this entry through the RSS 2.0. You can skip to the end and leave a response. Pinging is currently not allowed.